I'm trying to source a supplier for the waste cartridge for the Ricoh Aficio GX e3300N sublimation printer. Please could you advise me of a supplier in my area of Oxfordshire? Thanks, Jill. We do stock the genuine Ricoh 405700 waste ink collector which is used in standard Ricoh Aficio GX e3300N gel printers. However, we can't guarantee that this is the correct product for a sublimation printer so we'd advise you to check with the supplier of your machine before ordering any of these supplies. Can you supply me with an ink collector unit for the Ricoh Aficio GXe3300N printer? Sorry, we don't currently stock the item you require. We only have genuine Ricoh GX E3300N print cartridges in stock. Will out of date Ricoh GXe3300N ink cartridges still work? It's possible that they may still work but we couldn't guarantee this. The Ricoh Aficio GXe3300N gel cartridges we sell have a shelf life of 12 months from the dae of purchase if they're unopened and stored in a cool, dry place. You may find they start to dry out once the shelf life has expired. I'm looking for an ink collection unit for the Ricoh Aficio GX e3300n. Do you have these and can you give me a price? I thank you in advance for all your assistance with this matter. Kind regards, Mairead Smith Hume. Unfortunately, we don't currently stock a waste ink collector for the Ricoh GXe3300N printer, we only have the print cartridges. 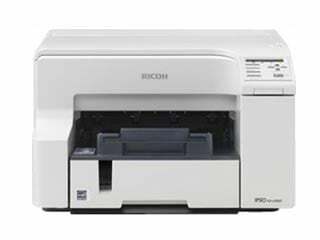 We would recommend that you contact Ricoh directly to try and source this specialist item. Do these Ricoh Aficio GXe3300N ink cartridges contain dye sublimation ink? No, our Ricoh Aficio GXe3300N ink cartridges are the standard Ricoh consumables. We don't supply any speciality inks or sublimation inks for these printers.